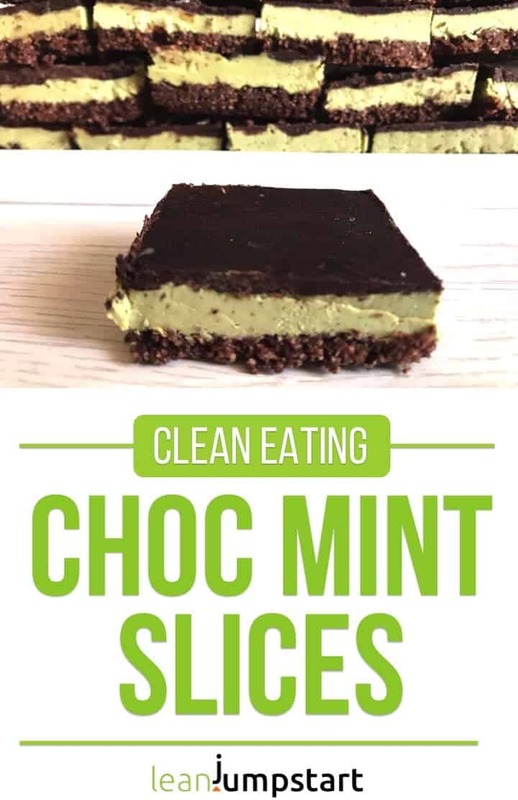 These choc mint slices are a happiness booster and a must have in your fridge if you think that emotional eating is interfering with your mindful eating habits. Make sure to read until the end of this blog post – especially if you are slightly sugar-addicted. As I’m still daily researching on the field of emotional eating, I knew that my next recipe had to be a clean eating treat based on dates. Why? Maybe you’ve heard that the happiness hormone “serotonin” is produced in your brain with the help of the amino acid “Tryptophan”. According to biologist Dr. Andrea Flemming – foods with a high tryptophan level and low protein content are the most effective serotonin producers. She found out that dates which are especially rich in Tryptophan – seem to have the perfect nutrient combination. A low Tryptophan level in your brain is hence associated with depression, anxiousness and other psychic problems, which can all lead to overeating and weight gain. Eating a few dates daily could be a delicious protective strategy for emotional eaters providing positive mood, better sleep, and weight loss. These raw chocolate peppermint cookies are a yummy treat, even for those of you who don’t like dates – as the chocolate-peppermint taste is dominating. Blend almonds, cacao powder and shredded coconut in your food processor until they have a flour-like consistency. Add coconut oil, dates, salt- and process again. Press the mixture with your hands in a square pan (about 25 x 15 cm). Place it in the freezer while you make the next layer. Put all the filling ingredients except the peppermint oil in the food processor and blend until you achieve a creamy texture. At last organic peppermint oil (start with 2 drops) and mix for a few seconds. Smooth the peppermint layer over the base layer and put it back in the freezer to set for at least 2 hours. Melt coconut oil over low heat in a small sauce pan. Add cacao powder and honey. Drizzle the chocolate layer evenly over the filling. Tilt the pan and spread to the edges until smooth. Put it back in the freezer to set for at least 1 hour. Check out my tip below where to best buy organic peppermint oil and how you can use it in addition. Where to get peppermint oil (food grade)? You can’t buy peppermint oil just like that in a grocery store or supermarket. The easiest way is to purchase it online e.g. at Amazon. My recommendation is the 100% Organic Peppermint Essential Oil by Rejuve Naturals. You can even use it for the treatment of headaches or nausea. Many stress eaters have also a sweet tooth and sometimes a sugar addiction is their biggest struggle when it comes to weight management. Eating sugar-rich foods on an empty stomach – even if it is honey – may spike their insulin levels and lead to an uncontrolled appetite once the insulin level drops again. To prevent this effect it is best to eat these chocolate slices or any other clean eating treat as dessert after a wholesome lunch or dinner. If you are like me you are curious to know which other foods have a perfect nutrient combination, when it comes to Tryptophan. The great thing about clean eating habits is that Tryptophan-rich foods are automatically included in most clean eating meals. …just to name a few. 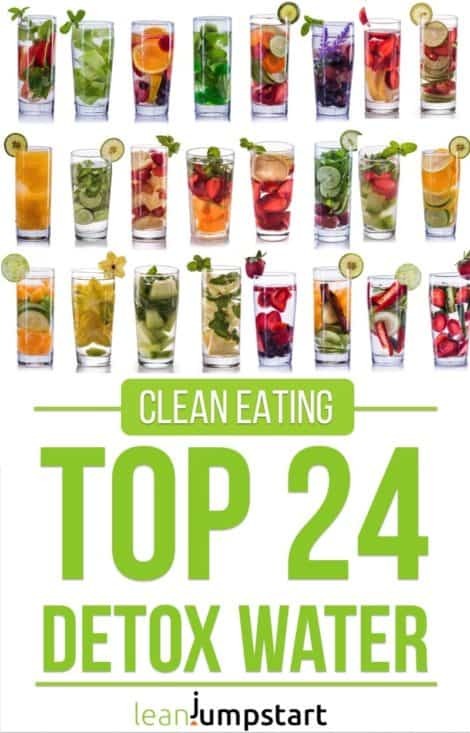 I’m sure it’ll be quite easy for you to incorporate some of those foods in your meal plan. 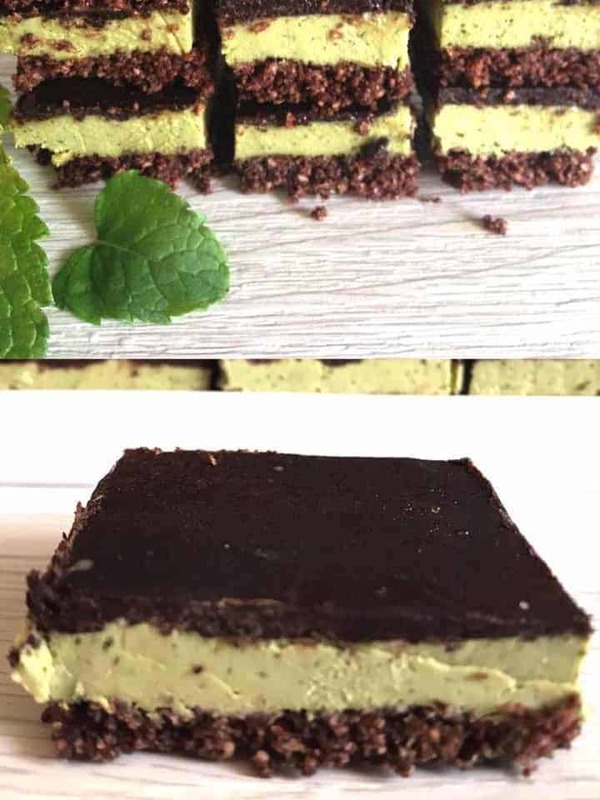 Looking at this list it doesn’t surprise that dates in combination with almonds and cacao powder make these chocolate-mint slices a happiness booster par excellence. Enjoy!